MSRP: $2499 for this Special Edition C-10 high modulus frame in matte-black Also available fully built, the Fuji D-6 1.0 and 2.0 range from $5619 to $8119. The Fuji D-6 3.0 and 4.0 have a slightly heavier frame and retail from $2449 to $2799. I’ve been in the market for a new tri bike for the past year; my previous tri bike was fast but had a lot of flex which made it a poor climber. But I was struggling trying to find the next one. While the marketplace doesn’t suffer from lack of choice, bikes seemed to fall in to two categories: too expensive or too commonplace. I was looking for something unique. When I saw an all matte-black Fuji D-6, with it’s sweeping organic shapes, innovative features, and massive rear triangle, I realized this was the bike for me! It was also encouraging that top pros/Olympians Matty Reid and Sarah Haskins also ride the D-6! The D-6 is a showcase of aero engineering. To reduce wind resistance, the front brake is mounted behind the fork, and the cables are internally routed through the steerer tube and exit via the fork. 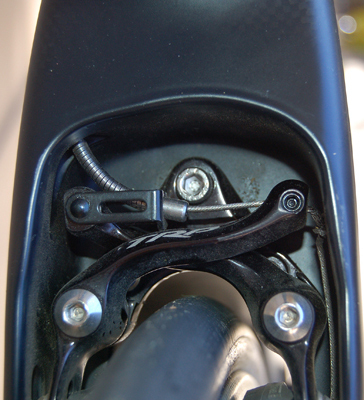 The rear brake also features completely internal cable routing and the brake itself is enclosed in a small “box”, completely out of the wind. 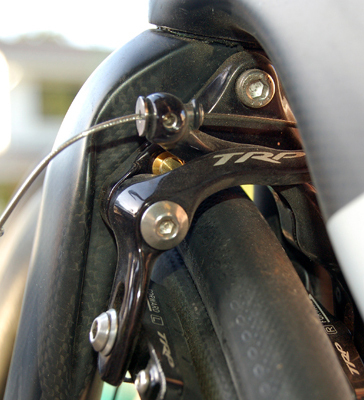 In the same vein, the derailleur cables are also internally routed to reduce aerodynamic drag. Moving on to the frame, it is an amazing blend of shapes that are designed to allow the wind to pass with minimal turbulence. 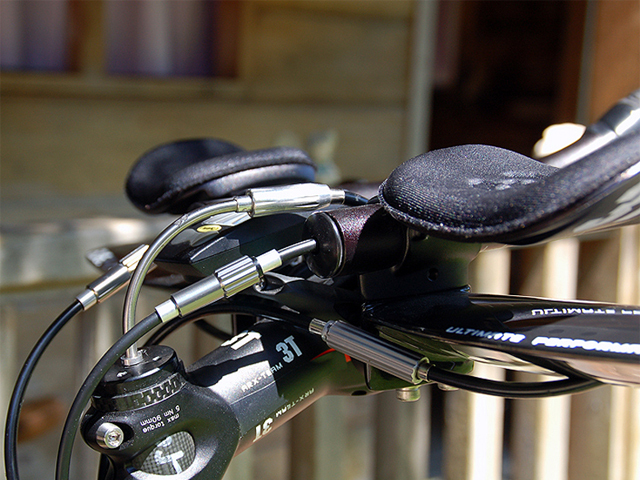 The innovation continues to the seat post and seat mast. 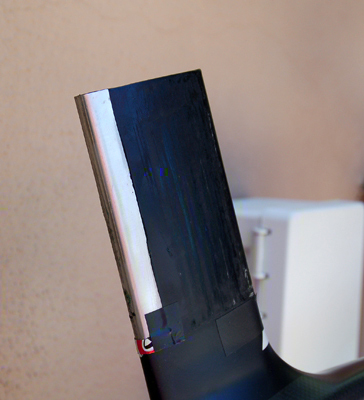 The integrated seat mast features an ingenious strip of aluminum along the edge that gets clamped; this prevents crushing of the carbon in the case of over-zealous tightening (Note-I did carve out and tape down an extra piece of aluminum from an old can to cover the last few millimeters of seatpost to match my seat height. Simple but effective). The seatpost itself is reasonably light and allows you to adjust fore/aft positions extremely easily, without affecting the seat angle. Lastly, the “track-style” wheel dropouts are fully replaceable on both sides. This all said, the amazing features that make this bike so aerodynamic also make it challenging to build. Make sure you have an experienced mechanic to dial it in for you. Enough already…how does it ride?! 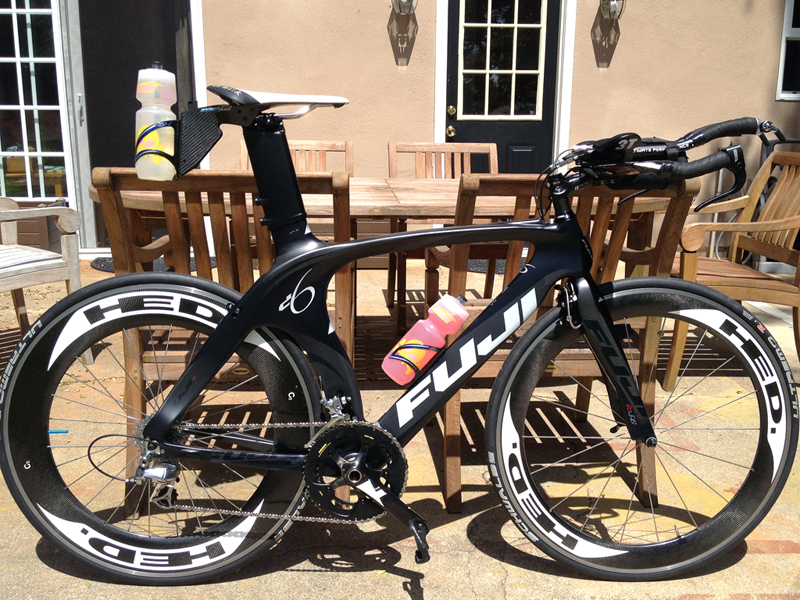 I wasn’t expecting a dramatic difference in this bike over my previous one–but I was wrong. This bike flat out FLIES. Though I was only able to ride the bike twice before competing in the Wildflower triathlon, I instantly knew it was faster. Riding the course pre-race, my normally evenly-matched buddy was struggling to keep up. In fact, I was able to ride away and had to wait up for him to catch up. During the race, the bike was incredible. No one passed me. In fact, after doing this same race for 11 years, my bike split was fully three minutes faster than average and nearly a minute faster than my previous PR. In an Olympic Race triathlon, three minutes is a huge advantage–the difference between a 42 minute 10k and a 39 minute 10k. The end result? I placed fourth in my age group, the best yet out of 11 attempts. The bike also climbs surprisingly well. On our local benchmark climb, Old La Honda, my PR for this year on my 3 pound lighter Cervelo S3 road bike is 20:11. One week later, I rode the Fuji up at 20:21. That’s impressive considering the greater weight and tri-specific design. What is truly remarkable about this frame is that it has a very firm yet balanced and comfortable ride. Many bikes these days have a very stiff rear end with a more compliant front end. This stiff rear can be very fatiguing over long rides or over rough roads. Other bikes have a very stiff front end but are too flexible in the rear which results in mediocre climbing. This bike has an optimal balance of stiffness across the front and rear. So while it is stiff, it has a unified feeling which is surprisingly comfortable. It is rare to find a bike that you truly look forward to riding each time you head out.. Often times there are little quibbles or imperfections that you notice. 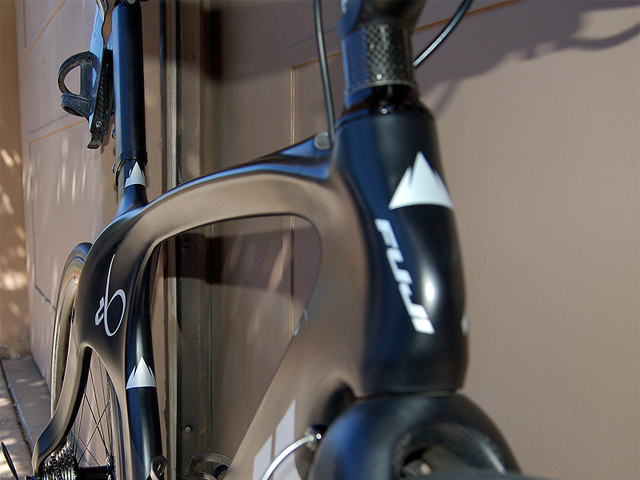 The Fuji D-6 is a bike that I truly look forward to riding–and riding FAST! Editor’s note-I replaced the Aura Pro bars with a Profile carbon base bars, 3t clip ons w/aero extensions, and Bontrager RXXXL Aero brake levers. It now comes in at 18 lbs 14 oz! @ egriffiths, I am a very cautious descender (since having kids). So I like the extra security/feel of the drop bars plus it’s great for climbing. The STI levers should be fine. I actually use early 1990-era Shimano Ultegra brake levers with bar end shifters in the aero bars. But STI should be fine. @ Mike – I am 5′ 11” and 3/4. You can get another shorter seatmast if needed; just order through a Fuji dealer (like Performance). I just inquired recently and they are easily available. I am right at the limit of the mast height; an inch or so lower and you’d need the shorter seatmast is what I’m getting at. You won’t be disappointed by this bike, though. It really accelerates like nothing I’ve ridden.